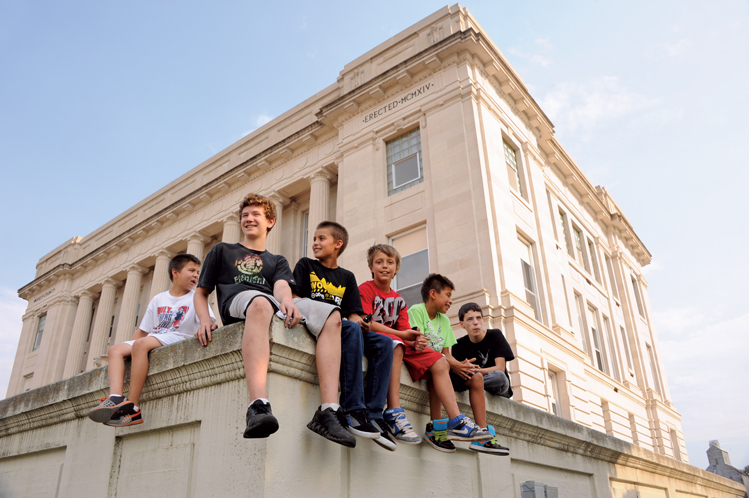 The Moody County Courthouse square is a popular gathering place for Flandreau youth. The courthouse, built in 1914, has an architectural twin in nearby Rock Rapids, Iowa. Both were designed by Sioux Falls architect Joseph Schwarz, who is best remembered for designing many Gothic-style Catholic churches in the region. Every Fourth of July in Flandreau’s restored 1880s railroad depot, the Lutheran ladies sell lefse by the pound, while nearby the Episcopal Church ladies dish out Indian tacos by the dozen. But neither snack outdraws the popular Long Johns that are baked daily a few blocks away at the 83-year-old Flandreau Bakery. The community’s gastronomic variety is one of many subtle and not so subtle dichotomies that blend in this Moody County community’s abundance of cultural habit and history. One of the state’s oldest communities, Flandreau was settled in 1857. Its tone and fabric since has been fashioned by white settlers and Native American homesteaders who found the good life along banks of the serpentine Big Sioux River. At Flandreau the river makes a right turn to tumble over the largest dam on the river and then meanders west through town before resuming its southward journey. That river twist inspired early Native Americans to refer to the heavily timbered river valley as “the bend in the river.” Decades earlier, trappers were at the bend in the 1830s. Flandreau is named after New Yorker Charles Flandrau, who came west as a young lawyer and took up railroading and the Dakota Land Corporation. Unfortunately, the town with his name is misspelled. A Flandreau newspaper editor in 1891 accidentally added the letter “e” to the type stick, and that spelling made it into history books. The main streets of downtown Flandreau feature a mix of facades, but the town's working class atmosphere is best personified in this business alley begind Pipestone Avenue, where Don Ulwelling has operated Don's Tire Shop for more than 25 years. At the river’s bend the two cultures often dance to different drummers. Citizens still trip the light fantastic in Flandreau’s iconic 1919 ballroom in Riverside Park while a mile away along the same river others do the grass dance to a resonating rawhide drum at the Flandreau Santee Sioux Tribe’s powwow grounds. The Japanese Gardens ballroom was named in the 1920s because of the colorful, inexpensive oriental paper decorations adorning its walls. It’s the last of the old dance halls in eastern South Dakota. Like the Japanese Garden, the tribe’s powwow ground for nearly 50 years is in a park-like, shaded swale along the river. The traditional dances of the two cultures are set aside most days of the week. “We take pride in working together with the tribe on matters of community concerns,” said Flandreau Mayor Brad Bonrud. “We have great cooperation.” Tony Reider, Flandreau Santee Sioux tribal president, agreed. “I can’t begin to count the number of ways we cooperate and work with the city,” he said. He mentioned the county Boys and Girls Club the tribe has taken on as a project for 200 children in the county. “But we try to get together whenever we can,” Mayor Bonrud said. The federal government took notice of the coexistence of the two cultures in 1883, bought the mission school and established the Flandreau Indian School that today is the nation’s oldest continuously operated federal Indian boarding school for grades 10 through 12. Betty Belkham, who served a dozen years as superintendent, said about 350 Native Americans representing 44 tribes from nine states live and study there. She likened the school to “a giant melting-pot of Native American cultures.” The Bureau of Indian Affairs school has an annual budget of about $5 million and 120 employees. Among its buildings is a museum of school and Native American artifacts. Last spring, 49 students graduated from the federal school. The Flandreau Public School in 2012 graduated 30. Across Highway 13 from the school is the venerable First Presbyterian Church, also known as River Bend Church that was organized in 1869. Members built the church in 1873. 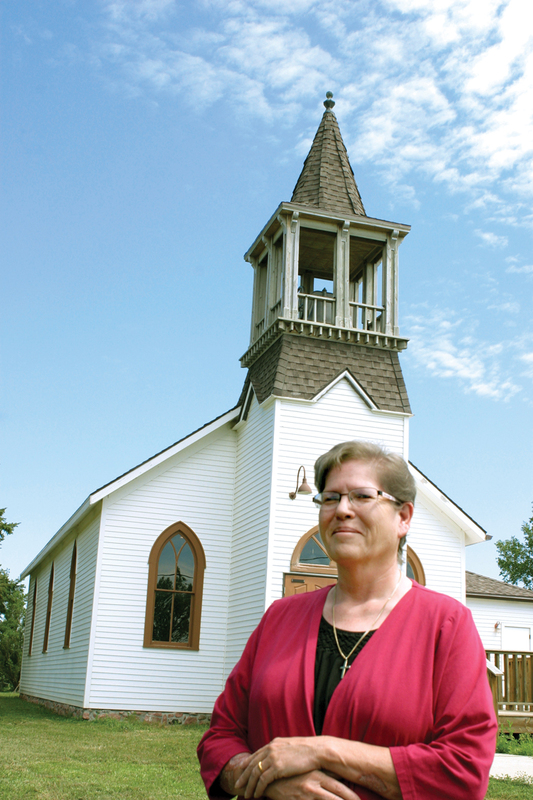 It is the oldest continuously used church in South Dakota, said Pastor Paula Armstrong. Before there was a church on the hill, Native Americans used a simple building they called the Bend in the River Meeting House. The refurbished building has been moved, stocked with historic memorabilia and is open weekday afternoons as part of the county’s impressive museum complex. 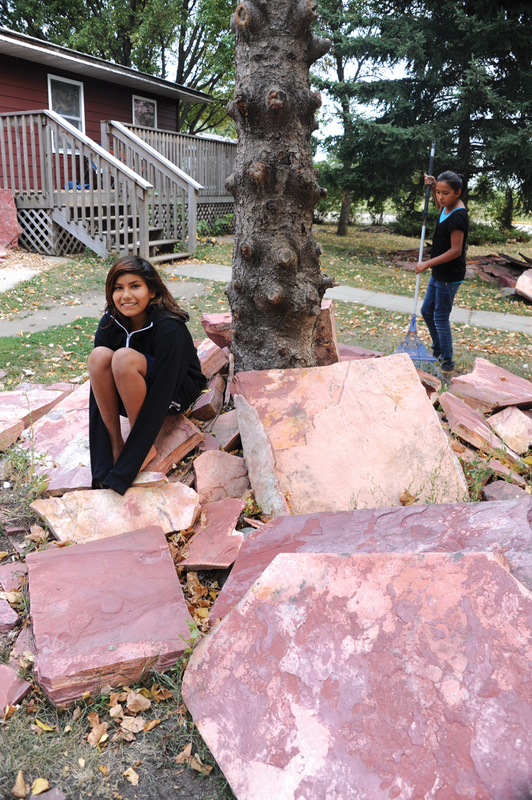 Grace (seated) and Gabby Flute Player enjoy a Flandreau front yard decorated with red pipestone. Their parents, Rick and Kelly Flute Player, and their siblings quarry the stone at Pipestone National Monument in Minnesota. Rick Flute Player makes ceremonial pipes from the catlinite, which is sacred in Lakota and Dakota culture. Another old timer, the privately owned, now empty St. Vincent Hotel with its broad veranda and 1887 look, is something of a museum piece in downtown Flandreau. Perhaps its most infamous guest was gangster John Dillinger, who stayed there while planning his successful March 6, 1934, robbery of the Sioux Falls Security National Bank. Flandreau’s tradition of the melding of cultures is also illustrated in some of its wealth of local art. Wall murals by Native American artist Paul Iron Cloud brighten the tribe’s Royal River Casino. Harvey Dunn’s salute to homesteaders, The First Furrow, and an 1895 painting by Elsbeth Jackson of a famous Indian woman of the late 1800s everyone at the Great Bend called “Granny Weston,” are in the County Resource Center near the high school. Just pass the town’s Aquatic Center there are fabulous paintings in the William Janklow Armory-Auditorium. The series are by then-Flandreau resident Dorothy Lyford, now of Brookings, who was commissioned to illustrate the city’s history as part of the city’s State Centennial Lasting Legacy project. One of those colorful slices shows the Flandreau Dam, the river’s largest. Concrete has replaced the first wooden barrier built in the late 1890s that until World War I ground wheat into “Golden Girl” and “Lily of the West” flour. A changing preference by area farmers to grow corn rather than wheat contributed to the mill’s demise. Today only part of its sluice remains. The dam is still a big draw. Noisy water cascades over the 12-foot high barrier, reinvigorating the pokey river that attracts fish and fishermen. Most of the flour in Flandreau that is kneaded in profusion today at the popular Flandreau Bakery isn’t the old mill’s “Golden Girl” variety. The late Mel Duncan, a popular businessman who later served 20 years as Flandreau’s mayor, started the bakery in 1930. His sons Ed and Don now operate what is the state’s oldest family bakery. “We make 32 different kinds of bread and 21 different pastries every day. Of the pastries our Long Johns are the best sellers,” Ed says. Ground corn, not wheat, is a big item on the menu at the Dakota Layers massive egg production facility north of town that was hatched in the late 1999 by 100 local farmers and businessmen led by second-generation Flandreau businessman and Dakota Layer President Scott Ramsdell. Hyline and Shaver hens peck away at a million bushels of ground corn and about 10,000 tons of soybean meal a year. The menu and the flock will be expanded soon to 1.3 million hens. Then the annual production will be about 324 million eggs trundling along the plant’s conveyor labyrinth to intricate sorting and packaging stations. “We’re the largest egg producer in the state and have the only in-shell, in-line pasteurizing system in the nation,” Ramsdell said. About 60 people work at the facility shipping eggs to Midwest groceries and to an expanding California market. Local artist Dorothy Lyford painted six large murals in Flandreau's armory as a state centennal project. Each painting is a montage of historical and cultural highlights that represent a 20-year period in the region's history. Although Flandreau’s wealth of cultural and historic attractions draws people to town, it’s the river that is the constant for everyone. Its profusion of flora and fauna has a magnetic attraction, just as it did for early Santee Sioux families who found the area similar to their former home in Minnesota. That momentous move to the bend in the river took place in 1869 when 25 Santee families became the first Sioux ever to take up homesteads. Those Native American settlers and others who followed in 1870 sought peace, which wasn’t the case for others who became involved in the Dakota Uprising of 1862. Leaders of the uprising were arrested, and 38 were hanged at Mankato, Minn., on Dec. 27, 1862. One leader, Chief Little Crow, was among many who were released. He died in 1863 at age 45. In 1971 his body was moved and reburied at the Native American Cemetery near the Bend in the River church. Not far from there his burial place is a monument to another uprising victim. Mrs. Joseph Thatcher and three other women were taken prisoner by Inkpaduta’s band near Lake Okoboji. Fleeing into the interior of what is now South Dakota, while crossing the Big Sioux River on a fallen log near what is now Riverside Park, Mrs. Thatcher fell into the river and drowned. A 10-foot high obelisk in her memory was erected in 1937 approximately 300 yards west of where she disappeared. After that uprising, about 1,300 uninvolved Santee Sioux were relegated to the Santee Agency in Niobrara, Nebraska. There, a few made the decision to leave the reservation and establish a community in 1869 at the bend in the Big Sioux River. They broke the nomadic mold, accepted Christianity, took up homesteads and adopted English names. Today the Flandreau Santee Sioux Tribe has a national membership of about 750, of which about 350 live in and near Flandreau. Paula Armstrong is pastor of First Presbyterian, the oldest continuously operating church in South Dakota. Contiguous to the Flandreau city limits is a portion of the tribe’s approximately 3,100 acres of trust land. The line between city and trust land is a street with access to the tribe’s attractive headquarters building and its well-equipped clinic. That area also boasts a comfortable Native American neighborhood. Nearby on the same trust land is the tribe’s glitzy Royal River Casino and Hotel, opened in 1992. It provides jobs to tribal members and others, and issues a monthly stipend to tribal members. The casino offers the River’s Bend dining area, and just down the hall is the auditorium where popular shows are staged. The tribal business complex also has an RV camping area, convenience store and bowling alley. Flandreau’s downtown Crystal Theater has also been a popular entertainment venue, although the last movies were shown in the early 1980s. The theater was falling in on itself. Interested citizens came forward, and with donated funds and labor, saw to its restoration. Today, with its showy original neon marquee lighting the way, the theater is a font of entertainment, from magic shows to speakers, and musical and dramatic presentations. It’s also home for the J.C. Wade Children’s Summer Theater, started by the late J. C. Wade. 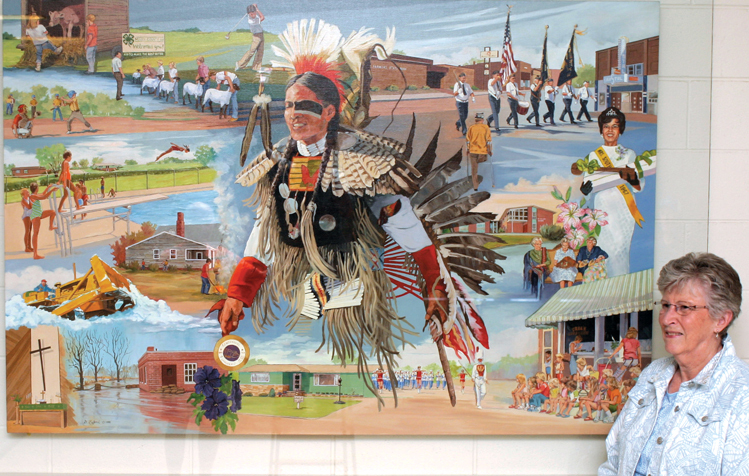 A member of the Flandreau Santee Sioux Tribe and recognized for his work nationally and in South Dakota in Native American education, Wade moved back to his hometown after retiring. A herd of 250 buffalo owned by the tribe as a tie to its past was an attraction to highway passersby in the 1990s. Now in that large pasture is a herd of about 50 that South Dakota State University scientists, tribal members and students at the Flandreau Indian School work with to find ways to better market the meat. For better police protection in the town of 2,400 and on the 3,100 acres of trust land and other Santee land — it owns 2,500 acres for which it pays property taxes — the tribal council and the city council formed a joint powers committee. The five Santee and six Flandreau residents on the committee meet monthly with the contracted Moody County Sheriff’s Department to discuss enforcement matters. “I believe Flandreau was the first, and it may be the only city in the state, where the tribe and the community work so well together in matters of law enforcement,” Mayor Bonrud said. That same cooperation, pride and community spirit tumbles out in so many other ways all along the historic and still popular Big Sioux Bend in the River. Editor’s Note: This story is revised from the November/December 2012 issue of South Dakota Magazine. To order a copy or to subscribe, call (800) 456-5117. I have a painting passed down through the family. Artist signed Elsbeth Jackson . Yours is the only information I have found on her regarding her painting of "Granny Watson". My great-grandparents were from Flandreau and a picture of my great uncle is taped on the back sitting under this painting in the great-grandparents' house,so I would presume this is the same Elsbeth Jackson. The painting is large and amazingly well done of a young girl & old man in a small boat. Can you tell me anything about Elsbeth or her works? I see a Elsbeth Jackson in the 1910 census - teacher at USD. Thank you for any help you might give me. Our family was very artistic and wondered if she might even be a relative.